This article is part of a series. We recommend that you first read: Fall 2015: Part 1 of 2 - My Testimony. RECAP: Michael Rathje came from Germany to Amazing Discoveries to work as a construction assistant. He watched Total Onslaught and was excited, changing his lifestyle and keeping the Sabbath. But pressure from friends and family makes him give up the truth and he returns to drugs and partying. He disconnects himself from Amazing Discoveries and returned to his old lifestyle. But the fight for his soul was not over. I got a job as a carpenter, framing half a house near Rob’s house. I worked there for about 5 months. Living with Rob I had a really good time. In terms of my old life I consider it the best time of “the life of an old man”. Since I had my car, there was plenty of marijuana in my life. I started testing other drugs like cocaine and more. I started to do Yoga and was involved in meditation. In other words, I tried to fill that spiritual life that I had with Jesus with something else. I now consciously realize was all from satan. After about 5-6 months I left Canada and went back to Germany. There I got back together again with all my friends smoking and drinking, just like my life was before. My family was also happy that I had finally returned home and life was good. Every once in a while I experienced deep depression for 1-2 days but I got out of it. I just found out in 2014 that I was actually very depressed, I just didn´t know at the time. I was in a 2 week class about depression in the Orion Foundation when I saw that I used to have a lot of symptoms. I gave myself the goal to do something special with my life to prove to myself that I can do more than just live my old life again. 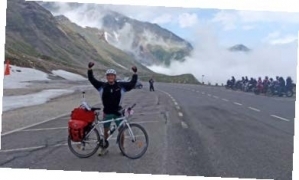 I decided, “I´m going to drive with my bicycle from Germany to Greece.” I dreamed about going over the Alps and camping at night at rivers and in forests. I prepared for about 2 months. I trained a lot, worked as a landscaper together with my friend Andreas to make some money. Then one day I drove off. I made it all the way to Greece. A big part of the trip was spent on a ferry to cross the Mediterranean Sea and from there I met my parents on the camping grounds where we used to go every other year of my life since birth. On the way I was super excited, it was just what I wanted. I got to the camping grounds, met my parents, and from there I experienced 2 weeks of depression. The reason for my depression was always the same! I wanted girls but I didn´t know how to have them. Praise the Lord, He gave me this self-respect which I could have pushed away. Also I suspect I had a very hard character so girls didn't want me. Today I’m happy that the Lord didn´t allow me to have what I wanted. I had enough problems with the experiences I had. We decided to go traveling together in the wintertime when there is no work as a landscaper. One day in September 2011 we got together in front of the computer to buy tickets for our trip. I suggested we go to Nepal, as I have always wanted to go there, but Andy said “let’s go to South America.” I said, “Okay, but next year I will go to Nepal.” We bought tickets for the 5th of January 2012. We kept working and having a good time and had no idea of what’s going to happen next. As we were all potheads, we didn´t prepare anything for the trip. We got to Rio de Janeiro and had no idea where we would stay or where to go. We wasted $2000 in the first 2 weeks. We were not very happy, we had no idea that Brazil is so expensive. Of course we didn´t speak a word of Spanish or Portuguese, the only words we learned in the next month were “ola,” “obregado,” “gracias,” and “cerveca.” Of course due to bad planning we got into trouble and the money just disappeared. This didn´t add to our excitement and the trip for me changed to a very unpleasant trip. After about 2 weeks we traveled on a bus from Sao Paulo to Iguazu Falls. I was looking out of the window of the bus meditating on my future life and how I´m going to have a carpentry job on Vancouver Island and frame houses etcetera… Some voice that I hadn´t heard for a long time, told me: “You are going to go to Bolivia, remember that talk you had with Wenzel about a missionary place in Bolivia?” This voice spoke for about 3 minutes long. I had mentioned to Wenzel that I liked to go to the jungle to work and help the poor people build stuff. So Wenzel told me about a place where he had gone to work for 2 weeks. In this moment the Holy Spirit talked to me and told me that I must go to this place. Praise God, He did not allow me to think twice. I made the decision without really thinking “why” or knowing what to do there. I was blinded with the idea that I would make a big missionary trip there for 2 weeks to give me a break from my drug and party life. I thought I’d eat some good vegetarian food and then after 2 weeks I would find my friend Andreas again to keep traveling along. So after some time I shared my idea with my friend Andres and he did not like the idea. But he has this nature to not confront problems but to hide them. So I did not understand his problem until 3 weeks after that. But during these 3 weeks, we were not happy with our trip. There was some bad spirit and I did not understand till one day in Mendoza Argentina I went to the internet coffee to look for my credit card which was stolen. There I was able to also call my friends Ludwig and Lucas. They all asked me: “Michi what happened? Andreas is writing me e-mails that you are going all crazy again with your religion stuff.” I did not understand at first, but then I figured out what was going on. Andreas was angry that whole time for leaving him alone on the trip for—what I thought would be—2 weeks. I returned to the hostel where we were staying and talked to Andreas but the thing was, he knew more than I knew about the future. He told me that I won’t come back and that I had planned this from before our trip and that I tricked him. I told him no, I will only go there for 2 weeks… but he knew me better. About 4-5 days before we separated, I told him… “I got this feeling I might stay longer than 4 weeks.” He said “I told you.” I really lament this parting story because he was a good friend and he has a big heart. On the 24 of February 2012 I entered Bolivia. After 5 days I arrived in Santa Cruz de la Sierra. I waited for Richard and David Gates to pick me up from the bus station. I still didn´t speak Spanish, I could not build a single sentence. I waited 4 hours, not knowing what Bolivia’s like at all. I had gotten their contacts prior to my arrival to let them know I’m coming, so waiting at the bus stop I smoked the last cigarette of my life (thought I didn’t know that at the time). I finished my smoke and Richard drives in front of me. I wouldn´t recognize them if I hadn’t had watched a sermon of David Gates when I was in Canada. I recognized David and I got in the car. While we were talking and chatting, Richard tells me “oh man we just observed a guy on the other side of the road for 15 minutes and were not sure if it’s you or not but then he got a pack of smokes out and we know it was not you.” That’s the work of the Lord. We got to the TV station “Red Advenir Canal 24” and there I had a little talk with Richard about how I am. Then they got me a room to stay in and the day was about to finish. I did not understand why I actually came there! I remember very well how I woke up after the first night in the canal. I heard a brother singing downstairs for the morning worship. A knock came at the door. A volunteer whom I got to know the night before opened the door and invited me to come to worship. I was very perplexed responded, “worship, sure!” In this moment God took away the veil which blinded me the whole time to see what the big plan was. I remembered the Sabbath and all the prophecies I had learned, and considered the truth about the Bible as the Word of God and accepted it as the only base of true faith. I went to worship but I don´t remember a thing. From this moment onwards I was in serious war with myself, for 3 days I mainly laid in my bed and stared at the ceiling, fighting with God about what I’m going to do. Since I’m experienced as a carpenter, I was to work building things for the TV station. But since I didn´t speak Spanish, and Richard the manager is super busy, I didn´t even get the materials to build the tables and bookshelves which I was asked to build. So I decided to just start drawing all the plans for the furniture which I was asked for, and so I passed the time for 2 weeks. From this moment I couldn´t resist anymore, I fell on my knees and told God that I cannot run away from Him anymore. I was tired of resisting the spirit. I repented for having bought the plane ticket and I gave my life to God. I got up from the floor with a peace in my heart as I have never felt before in my life. I felt all happy; I started walking around the campus of the TV station visiting the different missionary families. In the following 3 weeks, there happened to be a campaign in the church near the canal. A pastor from Jamaica who lived in the canal with his family preached the whole message of faith in Christ and more. 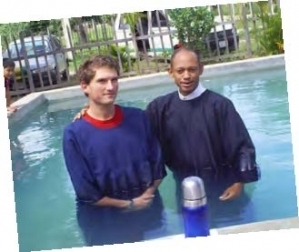 At the end of the series I got baptized together with 3 others from the local church. From that moment many things happened but to be honest I don´t remember anything super important or special until after 9 months in Red Advenir. 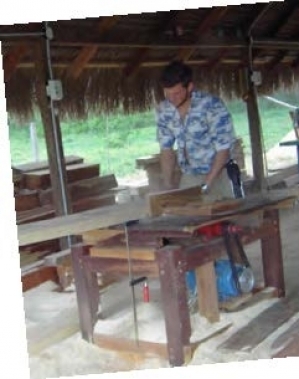 Most of the time I spent working, making tables, and constructing a little house with pastor Mark Chambers from Jamaica. I really enjoyed the work but I didn´t understand the time spent working on material things, time that could have been spent seeking the Lord. I was having devotionals almost every morning, reading the “Desire of all Nations” but I didn´t understand what I was reading. I received about 4 Bible studies and that was all. We had regular worships and sermons that kind of kept my spirit alive but when after about 6 months pastor Chambers left to the Quebrada Leon Institute to teach and live there with his family. I felt really sad. About 8 months after my baptism I was about to go back to the world, I already bought tickets for a round trip to Germany for 2 months but before I left the Lord had a little “energy drink” for me. About 1 month before my flight I decided to visit the institute Quebrada Leon (www.institutoqleon.org). On many occasions missionaries would come from the institute to visit or to stay overnight. When I was about to go, the devil tried to keep me away from there by using some people who spoke negatively about the place. In the end I went anyway. Getting there, I saw a light like I never saw light before. The atmosphere of the place made me happy and there was a spirit of joy and sanctity. I came for a week end but I stayed for 3 weeks and received many blessings and a lot of spiritual strength. Sometime around November 2012, I left to Germany for 2 months. This trip was not the will of God and I didn´t have any growth except downwards, but it was nice to see my family and to get to know the two churches closest to my parents’ house. Praise God, these two churches are the most conservative churches in all of Munich. There are very good people and they are faithful in teaching the Scriptures and the testimonies I heard were amazing. Also one of the brothers at one of the churches named “Gerhard Hermann” has a ministry which he supports through his construction company. 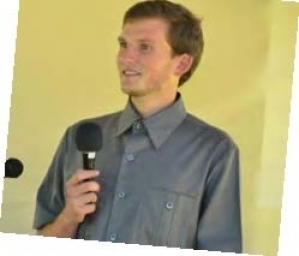 He supports fulltime missionaries and arranges events and lectures for the church members and the public. That’s where I got to know “Daniel Pel.” Actually, on my first Sabbath in Germany I went to the church in Sendling, Munich and Daniel held a sermon there. In the afternoon, we talked a bit about Amazing Discoveries and other topics. It is amazing, the Lord always has surprises for me. 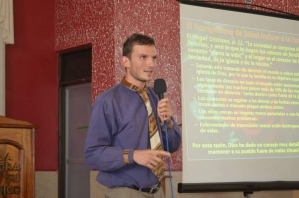 In February of 2013, I returned to Bolivia, back to the channel of “Red Advenir.” There I talked to Richard and promised him to be his maintenance supervisor. But God had different plans for me. Within the next 2 weeks Richard sent me to the institute to work there for 1 month building beds in their carpentry shop. I went and worked for 3 weeks. During that time, the Lord called me 3 times that I had to study there in the institute but I had said to myself when I left school, “never again will I sit behind a bench.” Finally I had to give in and I responded to the last call in March 2013. I started studying in the Quebrada Leon Institute. What’s this institute all about? First its owner and founder is Dr. Dosung Kim, a Korean man from the USA. He was called by God about 6 years ago to leave his entire life behind and come with his family to Bolivia. He bought a farm with 162 hectares of land and started building some little houses for a school and a sanatorium. 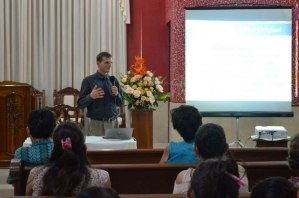 The school is a medical missionary school based on the Bible and the testimonies, based on the example of the “Madison School” founded by Ellen G. White. Their materials were supplied by a ministry called “Light” that had many different courses. There was also a program called “Lay Institute for Global Health Training” that covered health as well as spiritual classes. Also part of the training is the practical part of manual working. There were also classes for agriculture, vegetarian cooking and baking. There is also a very humble sanatorium where they received patients to be cured by the power of God through the use of natural remedies supplied by the God’s creation. There I studied for 2 years and got to know a lot of what it means to be a real Christian and follower of Christ. The communion with Christ and the Father through the Holy Spirit by the right understanding of the salvation by grace thought faith in Jesus Christ is the main and principal study of every Son and Daughter of God. As of 2015, I’m now in the institute as a volunteer, organizing the human resources for manual work and now participating in two “1 month light course.” The work is really nice and my spiritual growth is amazing. My favourite part is the spiritual part! Praise the Lord because He brought me so far this way. I’m very happy, even in tribulations and difficult times. For the Kingdom of Heaven is not eating nor drinking but justice, peace, and joy in the Holy Spirit.